International cotton prices moved in a relatively volatile nature during the month. 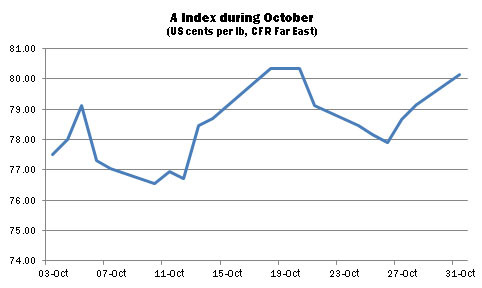 The Cotlook A Index fell to a low point of 76.55 US cents per lb on October 10, before recovering ground. A rally in New York, which culminated in the A Index registering a high of 80.35, was preceded by the release of USDA’s statistical report on October 12. Although the outlook for fundamentals did impact price sentiment, speculative influences remained a factor in the direction of ICE futures. Open interest has remained heavy, reaching an eight-year high late in the period. China’s electronic markets have also witnessed sharp price movements, and the differential between the Cotlook A Index and the China Cotton Index has continued to widen. The presence of fairly persistent mill demand continued to give support to prices, and spinners were thought to be still in need of considerable cover throughout the fourth quarter and beyond. A relatively broad range of growths found buyers, with demand concentrated mainly on cotton available for nearby shipment. Basis levels for Northern Hemisphere crops were fairly well maintained, with one notable exception being India. Cheaper Indian supplies, as harvest pressure builds, offer the most immediate threat to other basis levels. Local prices fell by around 16 percent during the month, prompting that origin’s return as a feature on the international market. The extent and, in particular, the duration of the Indian export selling initiative after the Diwali holidays will be watched with interest. The supply and demand balance sheet would appear restrictive, unless of course, as last year, Indian mills turn more heavily to imports later in the season. A revival in demand was noted from China after the market’s return from National Day holidays early in the month. The customary annual reallocation of unused import quota, together with the requirement to purchase supplies for shipment in time to meet quota deadlines, were influential factors but also the firm sentiment prevailing on the domestic market rendered international prices comparatively more attractive. 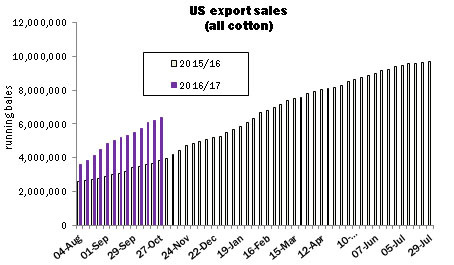 US cotton was the focus of China’s import demand and also featured prominently in business for other destinations. US export reports released during October displayed weekly net increases to commitments in the range of 132,000 to 340,000 running bales. The pace thus remained significantly ahead of last season, with cumulative commitments by October 27 being some 2.56 million bales more than by the corresponding date in 2015. The strength of export registrations prompted an increase in the US export projection in Washington’s October assessment of supply and demand, to 12 million statistical bales of 480lb, which would be around 2.85 million higher than the figure attained in 2015/16. Another change to the US balance sheet was a reduction in production of 140,000 bales, to 16 million, a direction observers expect might be reversed in USDA’s November estimates. US ending stocks were projected at roughly 4.3 million bales, 500,000 more than the opening stock and the heaviest since the 2008/09 season. Major changes to Cotlook’s assessment of the global supply and demand situation concerned decreases in the production outlook for the US and Pakistan, offset by improvements for India and various Southern Hemisphere countries. India’s Cotton Advisory Board released its first assessment of Indian output during 2016/17 in October. In view of the more positive tenor of crop reports, Cotlook’s number was increased to 35 million local bales (170 kgs), slightly below the CAB’s estimate. Our estimates of output in Brazil and Australia were also increased. In the former, near-ideal weather has facilitated the development of the soybean crop, which is traditionally harvested ahead of ‘safrinha’ (second crop) cotton plantings. An expectation persists of increased area and perhaps a return to more normal yields. In Australia, optimism with regard to the crop persisted, despite a delay to sowing in southern areas as a result of excessive rain. The moisture situation overall is construed as being highly favourable, which has prompted further increases in observers’ crop estimates. Cotlook’s figure envisages the heaviest output since the 2012/13 season. The situation in Pakistan was impacted by very high temperatures and resultant plant stress during the period. Fears emerged that the conditions might dent yield prospects, and our figure for that country was reduced by 50,000 tonnes, to 1.825 million. This would still be considerably higher than the 1.525 produced in 2015/16. Furthermore, some of the production doubts have since begun to dissipate. Cotlook’s assessment of global consumption underwent few changes during October, and little cause for optimism thus remains in evidence with regard to growth in mill use during the season ahead, which remains, by our projections, at a little over 1.5 percent. 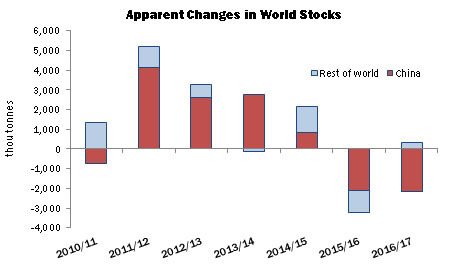 Our revised forecasts imply a smaller reduction than previously in world stocks, of slightly over 1.8 million tonnes, compared with a decrease of over 3.2 million in 2015/16. The downturn remains entirely the result of changes in China, where stocks are expected to fall by 2.16 million tonnes. In the rest of the world, an increase of 344,000 tonnes is projected, versus 189,000 tonnes in our last monthly report.